This recipe was cooked up by ASI based on the ‘Frozen Chocolate and Berry Chequerboard Parfait’ from the Crazy for Chocolate cookbook, part of the Kitchen Library Series by Bay Books. She did everything by herself, and except for a minor glitch where her beaten egg did not quite peak and had to start over again, she did quite well for her first attempt. We luckily had some very good strawberries on hand, and they were delicious in this dessert. The recipe also suggested raspberries as a good alternative or in addition to strawberries, but this time we couldn’t find raspberries in the store so this recipe only has strawberries. Prepare a loaf pan sized container, about 4x10x3 inch, by covering the insides with plastic wrap. Separate the eggs. Combine the white chocolate and 1/4 cup cream in a bowl and place on top of simmering water (double boiler). Stir the mixture gently until the chocolate is melted. When it is completely melted, slightly beat the 2 egg yolks and temper by adding a spoonfull of the melted chocolate mixture to warm it up, then slowly incorporate the egg yolks into the chocolate and cream mixture until well blended. Remove from the heat and let cool. In the meantime, in a separate bowl, whip the extra 1/2 cup of heavy cream until soft peaks form. Then again in another bowl, beat the egg whites until soft peaks form (this is where Asi messed up the first time around because she didn’t clean her beaters coming from whipping the cream. You have to make sure the beaters and bowl are dry and grease free or the egg whites will not attain peaks). Using a spatula, gently fold in the whipped cream and egg whites into the white chocolate mixture and pour into the pan. Place in the freezer to firm up while you work on the next layer. Place the strawberries in a blender or processor and process until smooth. In a separate bowl, combine the white chocolate, sugar, 1/4 cup cream and melt over a double boiler as in the first process with the white layer. When the chocolate is melted and the mixture is well blended, temper the egg yolks as before by first adding a spoonful of the warm mixture into the egg yolks then slowly pour the yolks into the chocolate/cream mixture. Stir together until smooth and blended. Set aside to cool. Again, as before, beat the remaining half cup of cream into peaks and the egg whites also beaten in a separate bowl until soft peaks form. Fold the cream and the beaten egg whites into the berry mixture and pour on top of the white layer. The white layer should be at a soft freeze stage by this time. Return the pan in the freezer and let harden for at least three hours or overnight. Unmold the parfait from the pan by turning it onto a board and pulling it loose by the plastic wrap. You’ll have to work swiftly to keep it from melting. Cut the bar lengthwise into four. Turn every other segment to get the checkerboard effect, and push them back together. Place a large piece of platic wrap over the block and place the pan back over. Gently turn up and return to the freezer while you prepare the berry sauce. In a blender, mix 1 pound of strawberries, 2 teaspoons of caster sugar, and 1/2 cup of water and blend until smooth and of pourable consistency. 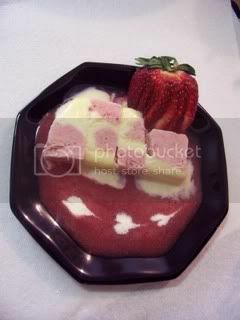 To serve, unmold the parfait again by turning on a board and pulling on the plastic wrap. Slice the block crosswise to get the checkerboard design. Pour some berry sauce on a plate and place a slice of the frozen parfait on top of the sauce. Garnish with whole strawberries, and enjoy! How cute! Must be yummy, too. 🙂 Maybe she can re-create it in our (L.A.) kitchen? Can’t wait to taste…yum! Wow! That’s beautiful. She did a great job! Oh My! Just by reading the instructions eh parang ayoko syang subukan, tikman pwede pa…hehehe. Tyaga nga ni Asi. Hi Thess, oo nga ako rin na surprise at pinagtyagaan niyang gawin. If they will depend on me to make this again, it will probably never happen. haha!! Thanks for leaving the new URL. I’ll be visiting now. Napaka colorful naman and tyaga ni Asi, nde madali process ha!